Blue jays. Blue birds. Blue bonnets. Blue skies that seem to go on forever. And occasionally, very occasionally, blueberries- in Oklahoma. These are some of the things that color my world. Berry picking is such a delight. But perhaps even more so, when you realize how hard it is for these little guys, the underdog, the bottom race horse, the low man on some proverbial mid-west agricultural totem pole to get here. No doubt, this climate is rough. Last year over 90 consecutive days over 100 degrees and we continue in a drought that rivals the dust bowl era. In recent years the record high and the record low can occur same year. This year Lavon Williams, of Maple Creek Berry Farms in Poteau, Oklahoma told me it was the giant hail (think bigger than softballs) that threatened his entire crop just two weeks before it was picking season. Last year the pond dug to water the crops was unexpectedly alkalizing their soil. Tiff-tough that's what his farm is made of. 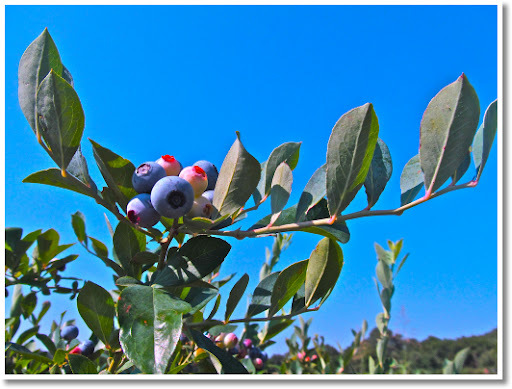 In southeastern Oklahoma he raises berries organically and in June we got to pick some! The $22 for a large 5 quart bucket or $4.50 a quart seemed more justified considering the challenges to get them there. And picking you own is certainly one of the most affordable ways to get your own organic fruit. Eating organic fruits whenever possible, also means you are minimizing everyone's exposure to pesticides- many of which began as derivatives of neurotoxins devised to be weapons of war. To me blueberries are one of the most delightful berries to pick. Little gems that keep shape without getting mushy. And you don't look like an axe murderer when you are done. 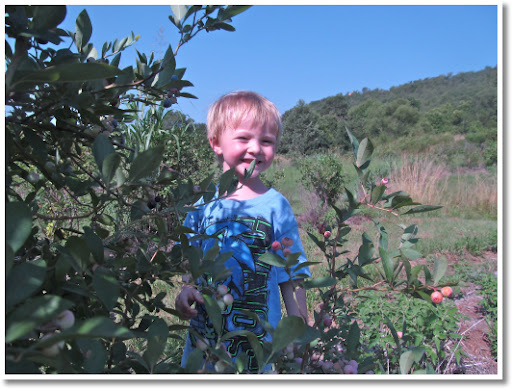 As my baby daughter and my husband sought out the shade, my two sons came to help me pick eye-spying which were ripe in each cluster. Plunk-plunk-plunk like prize marbles in our buckets. Marbles won in the game against shrewd mockingbirds greedily sitting onnearby trees. Hard earned loot for the six year old who learned the value of closed toed shoes as he combated ants. With two small handfuls in his bucket, my three year old had stopped abruptly. "Me go ask man if me have 'nough put mine ice cream." Indeed. His objective met, he was contentedly finished. In forty five min we amassed about four cups of blueberries and were reminded to pick while willing, but pack up soon enough they want to come back for more. Stay tuned for blueberry scones and breakfast in bed! Thanks for dropping in at our table! Feel free to insert a link back to your webpage here. We aim to publish legitimate comments. We welcome discussion, even dissension, but please try to be courteous and cite your sources. Feel free to link to this blog, recipes, or any posts within. Use any of the (non-human) images on your page but a link-back and credit is required. I’d love to know how you used it! You may not copy my content or recipes without my explicit permission. Do NOT repost or share (on Facebook, Pinterest etc.) in ANY way pictures with faces of my children or others on this site. Thanks! Hannah Harder. All rights reserved. Designed by YDP. Simple theme. Powered by Blogger.